If you’re looking for adventure on your next Costa Rica vacation, driving an ATV through the tropical jungle, across rocky beaches and through rushing rivers should be first on your list! ATV tours not only get your adrenaline pumping, but they give you premier waterfall access, offer stunning views of the tropical rainforests and let you explore the beautiful flora and fauna of Costa Rica. ATVs are all-terrain vehicles that you allow you speed across trails, glide over rocky terrain and splash through muddy paths while you look for monkeys, sloths, tropical birds and iguanas hiding in the surround tropical wet or dry forest. During your driving tour you may find a rushing waterfall, an amazing lookout point, screaming monkeys, peaceful cattle farms or a tropical river. You’re guaranteed breathtaking views no matter where you take your tour. Who can experience an ATV Tour safely? Basically anyone can enjoy an ATV adventure. It does not matter what skill level or amount of experience you have off-roading, ATV tours across Costa Rica have trails and machines for all skill levels. For those that are new to the sport, there are smoother trails that allow you to practice until you feel ready for more challenging paths. Many tours even take it slow so you can ride along while bird watching or riding on the beach. And for the more experienced riders, there are ATV tours that offer incredible trails filled with roots, mud, hills and curves that are guaranteed to get your blood pumping while you drive through the rainforest. Most ATV tours require drivers be at least 14- 16 years old and no riders under the age of four are allowed. Safety Precautions and What to bring? Safety is always the number one priority when riding anywhere. Tour operators make sure everyone is equipped with a helmet and gloves if needed. Before the start of the tour, tour operators will teach you basic ATV techniques and what to do in case of emergency. Guides will drive alone with you the entire way, so there’s no need to worry about getting lost. Soon after the safety demonstration you’ll be winding through trees in the forest like a pro! You should bring clothes that can get wet and muddy, tennis shoes, waterproof camera and water. Get off the beaten path today and go on an ATV ride of a lifetime in a tropical rainforest! ATV tours in Tamarindo, Guanacaste are an adventure from beginning to end! You’ll find 2- 6 hours tours that explore several beaches and rainforests. You’ll see a variety of wildlife while your guides lead through exiting paths. Note that ATV tours can be very different in the dry season in comparison to the rainy season. Some of the adventure tours can be combined. Enjoy hot springs, horseback riding, canopy tours and ATV tours all in one day! You’ll also find ATV tours all over the Guanacaste region, not just in Tamarindo. ATV tours in Manuel Antonio are truly unforgettable! Starting from Quepos you’ll drive through the mountains with a bilingual guide that leads through tropical forest to waterfalls, natural springs, plantations and traditional Costa Rican towns. You’ll learn about local agriculture, history and current environmental issues while you look for monkeys, sloths and toucans lounging in the overhead canopy. 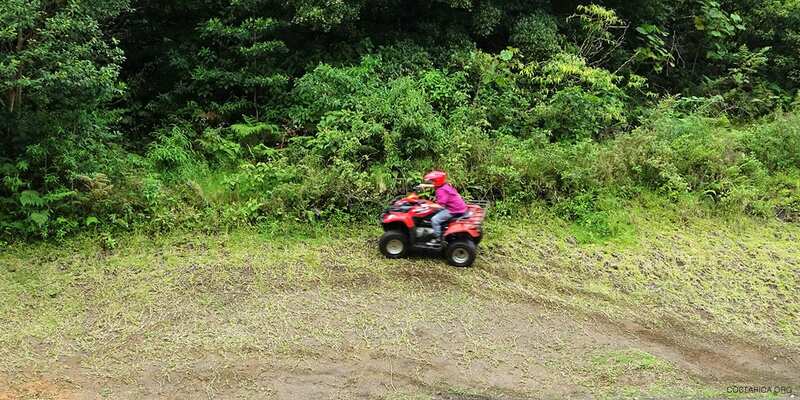 Experience the Monteverde Cloud Forest from a speeding ATV! Monteverde offers some of the best (and most fun) terrain for ATV tours in Costa Rica. You’ll have a fantastic time driving through the mountainous cloud forest while you watch closely for beautiful tropical wildlife. Listen for the Resplendent Quetzal chirping above your head. While you’re in Monteverde don’t miss the famous canopy tour over the Cloud Forest! The Arenal Volcano National Park and the area surrounding it is one the best places to visit in Costa Rica. It’s even better on the back of an ATV! ATV tours will let you see surrounding farms, the town of La Fortuna, the Arenal River, Lake Arenal and of course, the Arenal Volcano. Arenal. Adventure Guide, Drinks, Meal, Transfer, Equipment.